I've been working on a few super secret projects lately. I've been lucky enough to get a few pattern commissions from a UK crochet magazine, which has been a new and exciting development for me. So I've been playing secret squirrels and keeping things from you, which is a fun of a sort but it's a little hard to kerb the natural blogging instinct to share everything with you straight away! 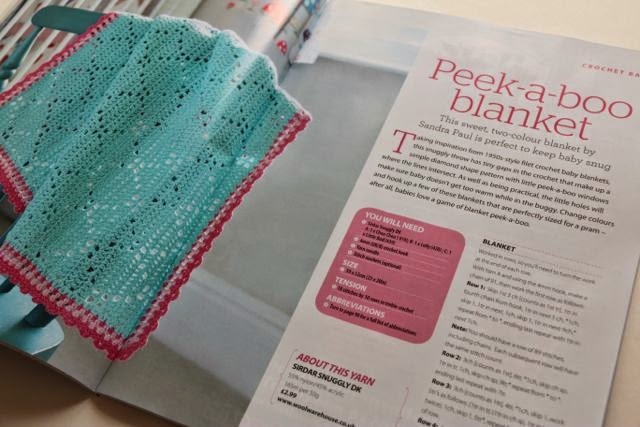 Happily though, I can now tell you about one of those super secret projects because it's no longer in hiding and has appeared out in the open for all to see in Love Crochet magazine. 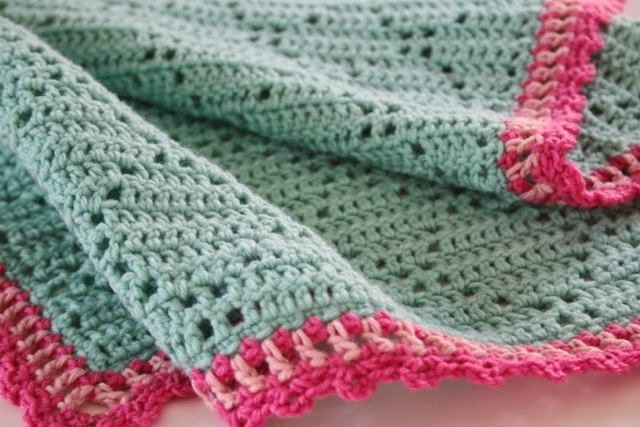 It's called, as you can see, 'Peek-a-boo Blanket' and I was thinking of those lovely fifties blankets that are simple but classic, with their patterns of holes as I made it. It's a nice easy to learn pattern too, so once the first few rows are under way and you can see what's what, you'll be flying through it. I added a little more detail to the edging to keep it interesting and I can't resist a little prettifying in the way of a crinkly edge. 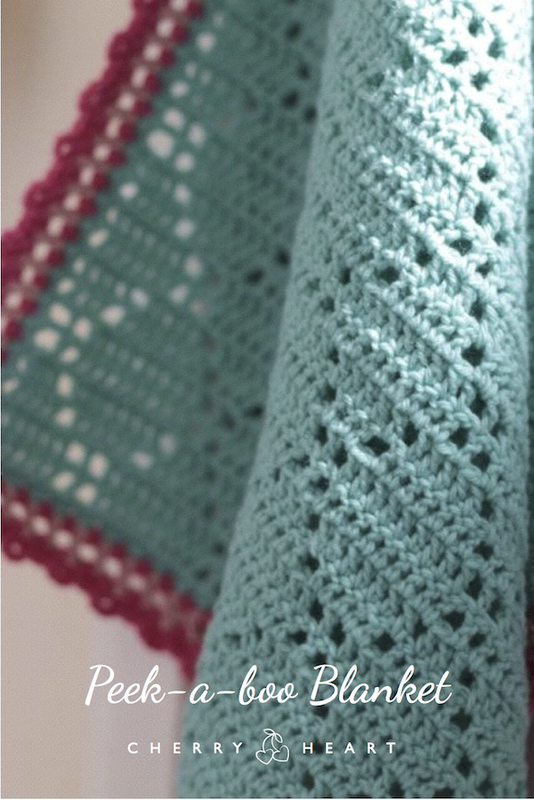 But the good news is that you can easily adapt the border to a less frilly look. That way it would be absolutely perfect for a boy too. 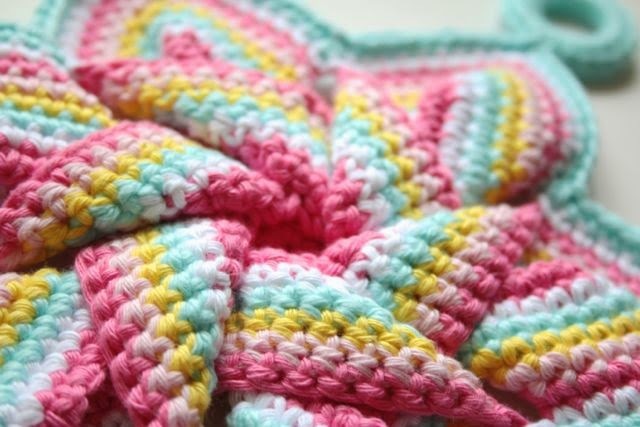 I used Sirdar Snuggly for the yarn because it's just the perfect thing for baby makes. Lovely and soft and snuggly for baby, easy peasy to clean in the machine and at a reasonable price for you too. I hope you like it and I've love to hear from you if you get a copy of the magazine and make one. I think it'd work well in lots of different colour combinations, so please do share! The magazine is only available in the UK (as far as I know) and I can't see any where that you can buy online, so I'm sorry my overseas friends, you'll have to wait a little longer to get your hands on this one but I will be able to release it for sale on my own site in time. 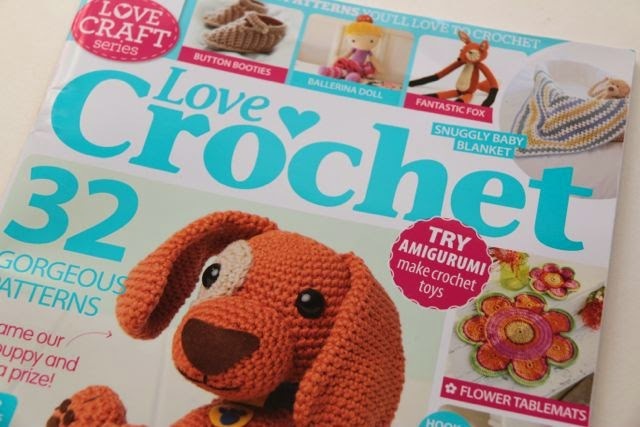 - Update (26th August 2014): Apparently you can get Love Crochet in the US at Barnes and Noble. Thanks for the tip Lee! - Update (1 September 2014): It's also available in Brisbane, so hopefully other places in Australia will stock it too - Thanks for the info Lisa! Oh and I completely forgot to include the pattern information for the potholder I made and shared in the last post. Please pop back to the 'Small Wins' post which I've updated to with all the details (scroll to bottom of the post). I hope you'll forgive me for not going back to each of you who asked about the pattern individually but holiday time is short so I thought this way would be quicker! Hello Sandra, sounds like you have been very busy. I can understand how hard it must have been to keep things 'under wraps'! 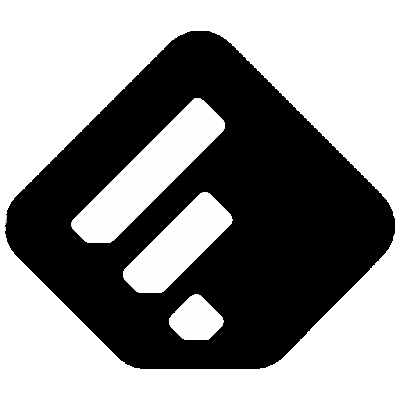 I reckon this is quite a classic design. I totally love the colours you chose, so pretty. You got your very own style, do you know that?!!! Congratulations on getting this commission! And well done! Sandra-- you can find that magazine in the US at Barnes and Noble Booksellers. There may be other places, but that's where I've found it before. 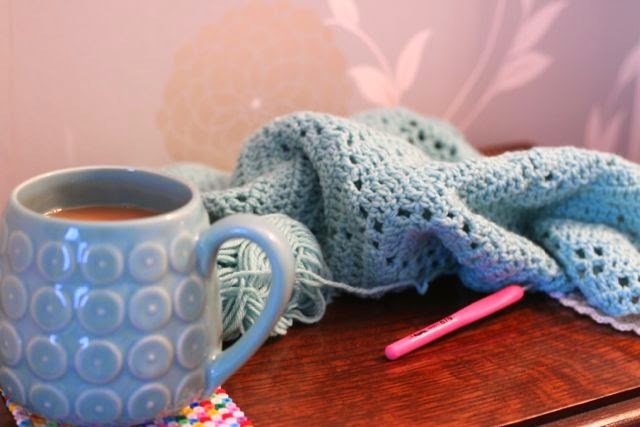 Congratulations to you on your published pattern-- it's beautiful! 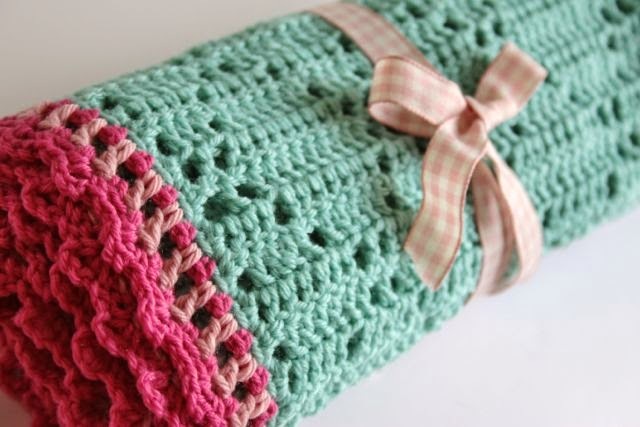 A dreamy blanket... love the colours! I agree. Time your hard work and talent was rewarded. But life isn't always fair and rewards others instead. However, you have a lovely body of work now that really shows of your designer credentials. 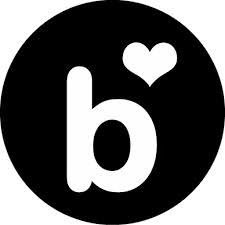 It is both has a lovely pretty aesthetic and is accomplished in design. They are tricky 'proper' designs and beyond us lesser mortals - well me anyway. Also you have variety which is always good. This is a lovely classic design that looks bang up to date. Oooo.....we are planning a visit to the mall this weekend (I almost never shop at malls! ), so I will look at our Barnes & Noble! Well done Sandra! What a sweet blankie! I'll be trying to get my hands on that mag - it'll be a few months down the line though before I'll get it....but get it I will! The blankie is so sweet! I love your color choices! Thank you for sharing the pot holder. I wanted to let you know I found the yarn for it in the USA. How precious is that little blanket? I love it and I'm going straight to B&N (online) and order that magazine! Yippee! Wow my dear Sandra, congratulations! You are famous and published ...I'm going to hurry and get me a copy of the magazine and try to make one of the blankets. My niece is having a baby and that would be a perfect time to make one. I feel so excited for you and so happy you have your pattern published. I love it! Congrats !!! What a wonderful blanket. Ho'omaka'i on the publication.